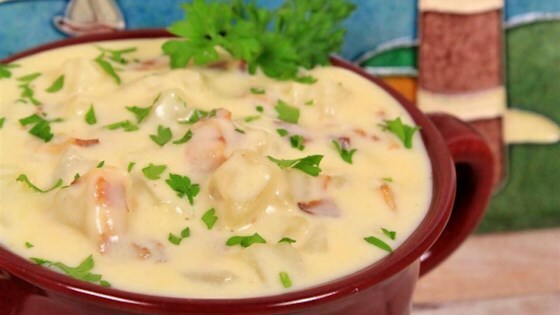 "This is absolutely the easiest potato soup ever! It can be dressed before serving with finely sliced green onions, shredded cheese, or sour cream. It's sure to be a family favorite." Whisk together cream of chicken soup and cream cheese in a large pot. Whisk in milk, 2 cups at a time, until smooth. Stir in hash brown potatoes, bacon, butter-flavored granules, salt, and pepper. Bring soup to a boil over medium-high heat, then reduce heat to medium-low and simmer until potatoes are tender, 30 to 45 minutes. As good as can be just as written. Made no changes at all. My ladies loved it. Quick and easy. Perfect for those cold or chilly nights! This soup is incredible! I used 1/2 half and half and 1/2 2% milk instead of all 2% milk. It was amazing!